There are 4.3 million retail salespeople in the United States, equivalent to the state population of Kentucky. And there are 310 prosthodontists -- that is, dentists specializing in prosthetic teeth -- which is enough to fill, well, a medium-sized lecture hall. Three more interesting nuggets from the report. (1) The most "urban" job in America -- that is, with the highest concentration in metro areas -- isn't technically a job in U.S. cities, but above U.S. cities. It's flight attendants. 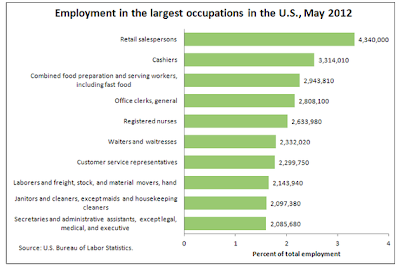 (2) What's the most common government job? Depends on the level of government. At the federal level, it's postal service workers. In state governments, it's correctional officers and jailers. 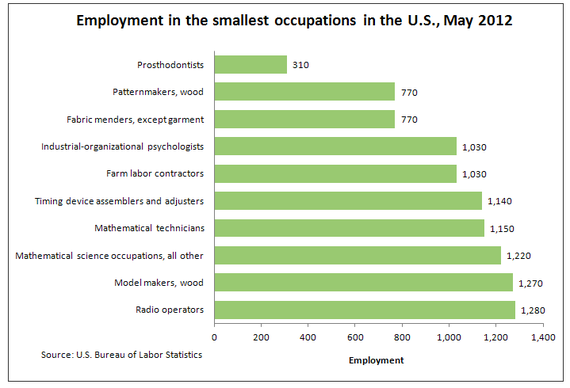 And at the local level, teachers aren't just the largest job category. At various levels of education, they're the five largest job categories. (3) Shampooers are more likely to live in cities than software developers. Now you know. If you're interested in learning more about shampooers, this page is your new heaven.